I have several portable shortwave receivers, modern and antique. My favorite modern shortwave is the Sony ICF-2010. I purchased it back in 1989. It was a bit expensive (about $350 as I remember) but I had just received a stipend for participating in an education research project at Brown University and so I had a little extra money. Most of it went to my wife. The balance went for the Sony. The 2010 tunes the entire HF shortwave spectrum, broadcast AM and FM, and airband. The tuning is digital, it has 32 station memory slots and it has synchronous detection. It was quite advanced for its time and still is considered one of the best portables ever made. That’s how I felt until one day several months ago when I pulled it out of the nightstand and turned it on for some bedtime shortwave listening (SWL). The audio was badly distorted. Click on the video below to hear for yourself. Switching from batteries to plug-in transformer made no difference. It sounded similar to what happens to my vintage radios when the power supply electrolytic filter capacitors go bad. 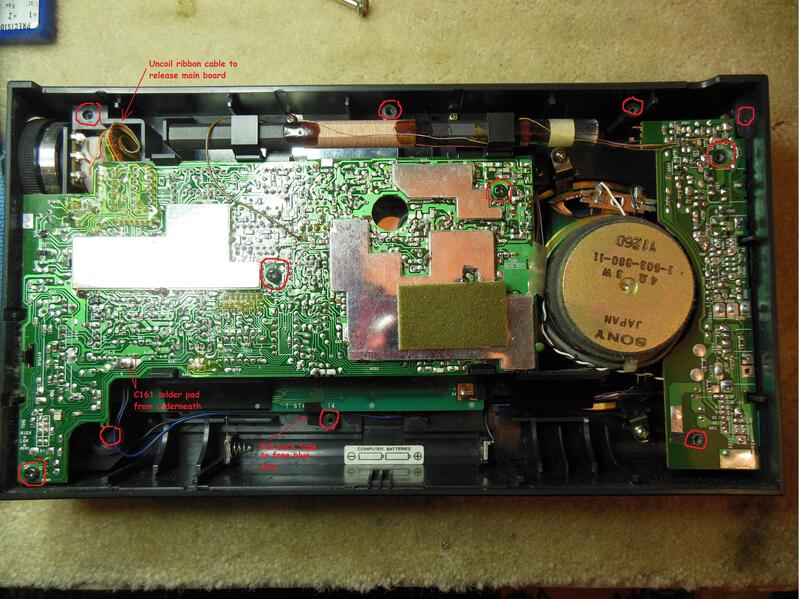 It’s an easy fix in the old radios because the capacitors are a cinch to spot (and the circuit diagrams are helpful too). 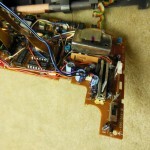 But in a modern radio that uses surface mount technology and numerous circuit boards arranged in layers and attached by ribbon cable it can be a nightmare. First I had to confirm that I was on the right track in suspecting the power supply. I immediately joined the 2010 user group on Yahoo and posted my problem. Fortunately I got a response from Rod, KB8DNS. 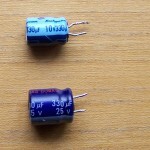 He not only confirmed that it sounded like a capacitor but he also told me which one (C161) and its value (330mfd @10 volts). Just to be sure I posted a video of my broken radio on You Tube and asked Rod to give a listen. He responded “Yes, that is what it is, the audio capacitor C161, not too far from the volume slide”. An audio capacitor? OK, now how do I get to it? 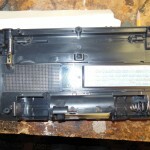 Well, Rod had previously posted a video of him opening a Sony ICF-2010 and replacing C161. I watched the video to get a few hints on how to do the deed. Next I needed the replacement capacitor. There were none in my stock because I usually repair just old radios (low capacitance, high voltage) and this was a modern one (high capacitance, low voltage). Fortunately I had in my junk box (everyone needs a junk box or two) an old circuit board that I pulled from a defunct UPS. 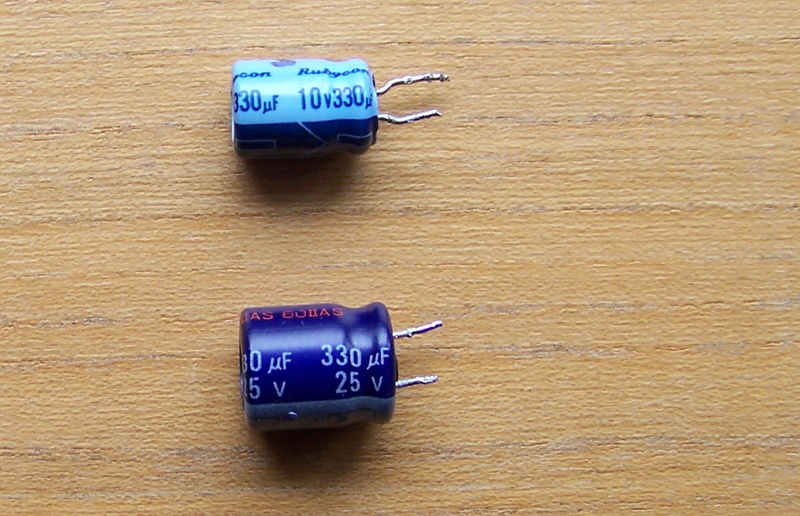 I removed two capacitors, both of them 330 mfd @25 volts. They would be fine. 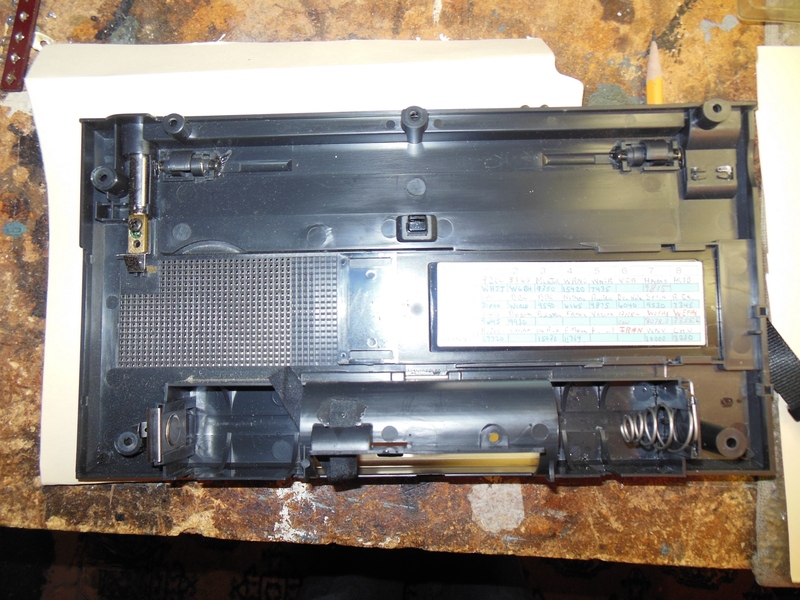 I straightened the leads and began taking apart the Sony. The main circuit board is now exposed. Remove the three screws holding it. Of course I could not wait for reassembly to test the radio. As soon as the new cap was in I connected up power to the external DC-in port and turned it on. Nothing. I tried several times, moving the on/off switches around, adjusting the control board fit, etc. It was now a dead radio. I decided to close it up and try batteries. I put in three new D-cells and again there was no life. I was ready to list the radio on eBay as a “dead radio,killed by owner“. Then I noticed that I had not installed the two AA computer batteries. Were they necessary to make this thing run? I couldn’t even remember. They were just to retain the memory, right? I was grasping at straws so I installed the computer batteries and immediately noticed that the clock came alive. Upon activating the Power and On switches the radio came alive! Every band sounded great. Watch and listen to the above video to see how well it works. The Sony was back! Sony ICF-2010/2001D user group. This is a very active and helpful group. They even have a file library with the User Manual and a Service Manual that you can download. Review of the ICF-2010 by Jonathan Marks. If this blog was useful or interesting, please use the social media buttons below to let others know about it. I also encourage you to use the comment area. Thanks! 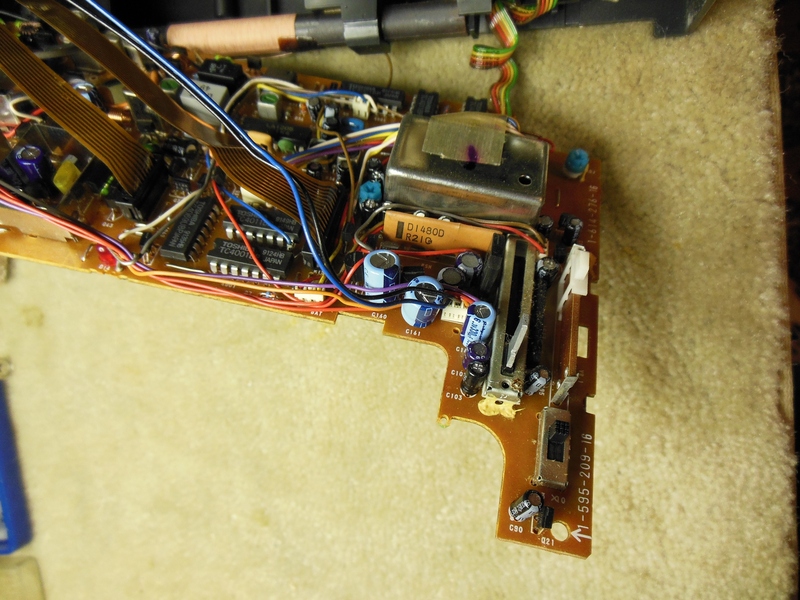 This entry was posted in Occasional Commentary, Radio: Amateur & Broadcast and tagged 2010, audio, bad, c161, capacitor, DIY, how, ICF-2010, repair, shortwave, Sony, to. Bookmark the permalink. Thanks just read your remarks about the 2 AA batteries, that solved one problem. Have one more and am looking for a good repair house. I do have a recommendation for someone to do repairs. a man named Rod. Many people in the group have been happy with repairs he has done. You can also post questions about the problem your radio has and you may find a fix. Rod is the one who pointed me towards the repair I made. Good luck! To add to my post concerning my”Failed” Sony ICF 2001D,please send all replies to my email address.Kenneth please display it if you are allowed to,if not it’s okay.Many thanks from James. This is a copy of the email I received from James. If anyone is able to assist him please respond directly to his email address. Comment: Hi Kenneth.This is James way down in the South pacific,country of New Zealand,city of Auckland.I am a very keen radio collector,also a Ham radio operator.ZL1WJP.In NZ,there are very few resources as to parts available for repairing radios eg the Sony ICF 2001D/2010.I bought a pre owned one at a Ham radio equipment sale recently.Upon testing it at home,found caps were good,and receiption was excellent on all bands includeing the UHF AIR band.But then I noticed that the SSB/BFO was slightly out of tune.Meaning that I needed to tune away off, from an offical frequency befor I could hear it properly,even with the “Slow tune”.So I decided to open up the radio,takeing off the rear case cover.Then I loosened the circuit board lifting it up enough to find the BFO stage,then corrected it to ” Top Dead Center”.I tested the radio with the power supply hence the main batteries were out,computer AA batteries were still in.The radio worked perfectly,I was very pleased,since I listen to SSB mostly.But then everything went so terribly wrong.The radio went dead.I noticed that one of the very thin flat”Ribbon”cables had torn,right at the socket that plugs onto the board.This was the shortest of two ribbon cables.There would have been a slight strain on it,with lifting up the board.So I unpluged the cable and tried to bridge the torn part with very thin copper wire soldered on.A very difficult job indeed.Under a magnify glass,all seemed to be intact.So pluging it back in carefully,and turning the Sony back on,all I now get is a hiss sound.Everything seems to work except I have no RF signal getting to the board it seems.The digital dial knob works (counts up and down),lamp works,battery check light works,RF gain and volume work,wide/narrow,SSB buttons all work because you can hear a change in audio sound when they are all pressed.But no RF audio.I put my finger over a part of the board and touch the circuit and I hear AM stations all mixed.So seems the board is working.I have checked for loose wires/plugs on the narrow circuit board where the ferrite rod and power wires are attached,all seems fine.So can anyone help me with this.I can not find anything on You Tube or web sites of a repair of this type.The Ribbon cable may still be faulty.Ive checked all the capacitors,they all look to be in good condition,and the radio worked very well and very clear previously.I wish now I had not needed to fix the BFO problem.The radio in its original condition,with the age of it,is probably why the Ribbon cable was so fragile and brittle,causeing it to tear.The two ribbon cables join underneath to become one cable attached to the second board.I dont think I’ll be able to find another Sony 2010/2001D for parts or one thats working,because over here in New Zealand there would be very few left arround any where by now.But when they were made new,they were Sony’s Flag ship radio.I have a few other Sonys in my collection,all working well.But the ICF 2001D/2010 is indeed a collector’s radio to me,and Im most disapointed with what has happened.This model has the ICF 2001D stamped on it.If anyone is able to help with this,I would indeed appreciate it very much. Thankyou kindly. Hello: I found that if, when replacing C-161, that if you use a _lower_ value of capacitor instead of the factory value, that the audio output will no longer sound like someone mumbling with a mouth full of gravel. I used a 100ufd electrolytic capacitor instead of the factory value and the resulting audio has increased treble and a lot less base which really improves intelligibility. Also it’s cheap compared to replacing a ceramic IF filter. OOPS!!! I apologize! I had forgotten that I had written about this same modification back in 2016. Not a problem! Some things need to be repeated. Bill, … I do not know what it means. Does it work on batteries only? In that case I would suspect the power supply or the connection where it attaches to the radio. Are both on/off switches in ‘On’ mode? Are you using the original Sony power supply? Check to see if any of the batteries are loose. That happens often. Otherwise I would subscribe to the Sony ICF 2010 discussion group on Yahoo and pose the question there. Give as much information as you can and I suspect someone will have a good idea of what is happening. 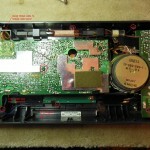 I ve got old old sony icf 2010 and want to recap the radio , does anyone have a list of all caps needed ? It contains the schematic with labled capacitors. I do not know if it has a separate component list. You will need to check.